After the death of her father, Ronit Khruska (Rachel Weisz) leaves her life in New York to return to her Orthodox Jewish community. However, her visit is not welcomed by all - particularly when she shows an interest in rekindling her relationship with Esti (Rachel McAdams), an old childhood friend. 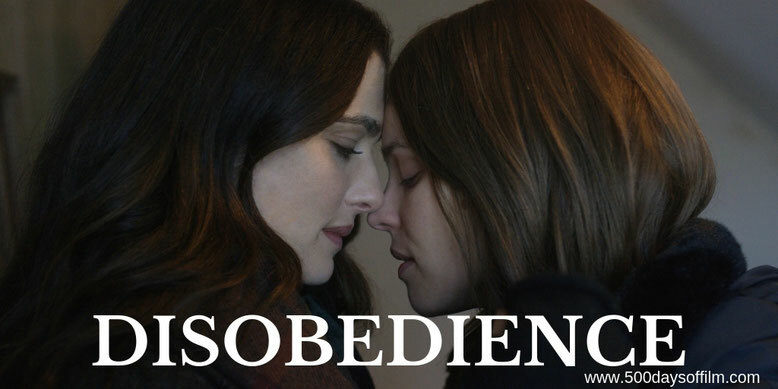 When Rachel Weisz and her producing partner, Frida Torresblanco, decided to adapt Naomi Alderman’s 2006 award-winning novel, Disobedience, one of their most important decisions was who to pick as their film's director. For example, in Lelio's Oscar-winning film, A Fantastic Woman, we watch as Marina Vidal’s (wonderfully played by Daniela Vega) life implodes after the sudden death of her lover, Orlando. His family will not recognise her relationship with Orlando - scorning and abusing her because she is a trans woman. Disobedience also begins after a death - that of Ronit’s father, Rav Krushka, a Rabbi from a Orthodox Jewish community in North London. The bereavement brings her back home from New York where she has made a new life as a photographer. Her return is met with hostility from the people she left behind. She seeks refuge at the home of her old friends, Dovid and his wife, Esti. From the start, we are aware that the community views Ronit as dangerous - particularly when it comes to her friendship with Esti. Like in A Fantastic Woman, Lelio inspires superb performances from Disobedience’s impressive cast. Initially, this seems like Ronit’s story and Rachel Weisz plays her conflicts and contradictions to perfection. However, as the film progresses, we understand that this is actually Esti’s story. In a career best performance, Rachel McAdams is utterly breathtaking. Following Ronit’s return, we watch Esti come back to life and reveal her desire for the freedom to be who she wants to be, love who she wants to love. The change in Esti is not conveyed via dramatic exposition but with a look, a loaded expression, a change in posture. She transforms into a woman who, having been denied passionate love, is desperate for the emotional and physical intimacy that Ronit offers. Weisz and McAdams are so good that it is easy to overlook Alessandro Nivola’s performance as Dovid. However, he plays an equally important part - this is a love story between three people. Nivola is brilliant in a role that, like Ronit and Esti, sees his character struggle with duty and the weight of a community’s expectation. While Disobedience moves slowly, it is never anything less than gripping. It is fascinating to observe the traditions of this Jewish Orthodox community within a story that explores universal themes of love and acceptance. ‘We’re going through a war in which only certain relationships are considered legitimate and who draws the line where and with which authority,” says Lelio. “This is a story about characters that are willing to change and evolve, but to do so they have to go through very rigid structures and that confrontation resonates with what we’re going through nowadays as a human society all over the world’. Have you seen Disobedience? If you have, what did you think of this film? Let me know in the comments section below or via Twitter. You can find me @500DaysOfFilm.